International nail artist and beauty industry expert Tracylee Percival (@luxebytracylee) created these coral nails inspired by Pantone’s Color of the Year, Coral. 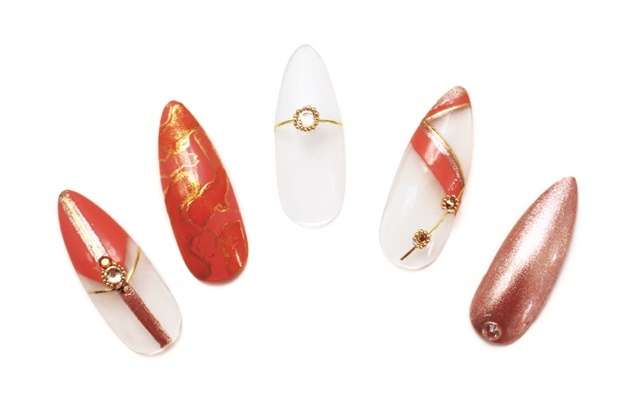 Percival decided on an almond shape for a dramatic effect, but says that any shape will work for these nails. She chose a graphic design using mixed-media, including polish, crystals, striping tape, beads and flowers to invoke the feeling of spring. 1. Paint one nail with Butter London Living Coral. 2. Paint one nail with Orly Lucid Dream. Apply one crystal, centered at the base of the nail. 1. Using a coral color, paint a diamond shape from the top of the nail. 2. Using a rose gold color, paint a line from the center of the tip to the cuticle. 3. Using gold striping tape, place down the center of the rose gold line, halfway down the nail from the tip. 4. Using gold striping tape, place at an angle on either side of the rose gold stripe. 5. Apply crystals of three different sizes and colors. Place the largest in the middle. 6. Apply gold bullion beads around the largest crystal in the center to make a flower. 1. Place three large drops of the orange ink paint on the coral nail in different locations. Immediately drop the gold ink paint in the center of the orange and move the nail around to get it to flow down the nail in different directions. Drop gold ink paint spots (without orange) to fill in bare areas. 1. Apply gold striping tape across the center of the nail. 2. Place a large crystal in the center of the gold tape. 3. Place gold bullion beads surrounding the crystal to make a flower. 1. Paint graphic lines in the shape of a sideways "V" at the tip of the nail, using coral. 2. Paint thinner lines, directly next to the coral lines, using rose gold. 3. Apply gold striping tape to both inside lines of the "V" and one angled down toward the cuticle from the side. Adhere two small crystals on that line. 4. Adhere gold bullion beads around the crystals to create flowers.